Over the last few years I have helped to raise awareness of breast cancer in Scotland by piping on behalf of 'Breast Cancer Care', 'Walkthewalk' and 'Breast Cancer Campaign'. 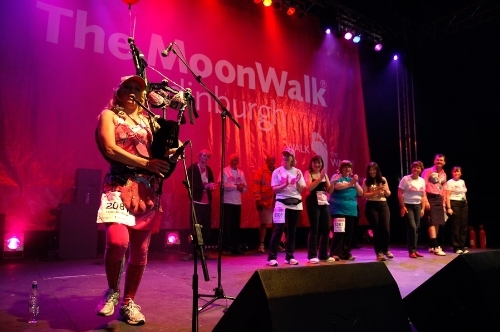 Since the launch of the Edinburgh Moonwalk 2006 by Walkthewalk, I have performed every year as the 'Pink Piper'! Walkthewalk was founded by Nina Barough CBE (see www.walkthewalk.org), in order to raise awareness of breast cancer and to raise much needed funds to treat and research the causes of breast cancer!! 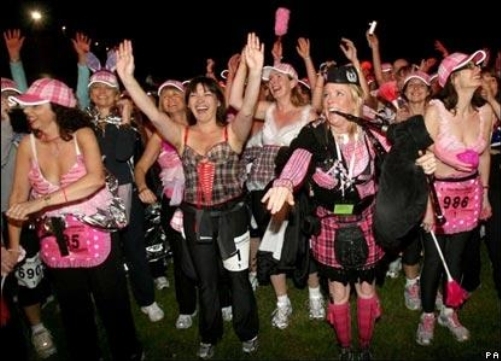 12,000 bra-clad women and men take to the streets of Edinburgh and take part in a Moonwalk (either a half marathon or a full marathon) to raise critical funding for this excellent cause!! 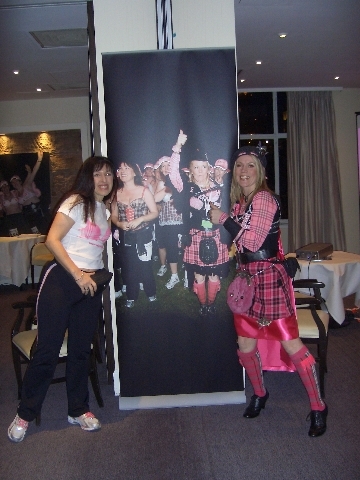 Well done to all involved and see you there again for The Edinburgh Moonwalk 2010!!!!!!!!!! 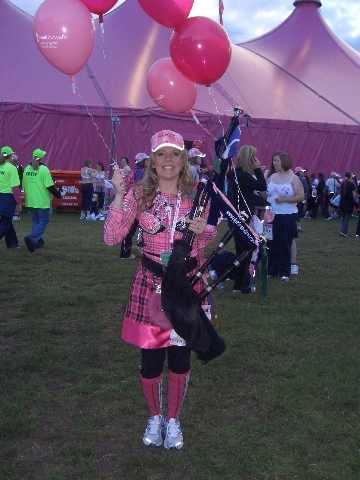 I hope you enjoy looking at the photos of 'The Pink Piper' in action at the Edinburgh Moonwalk 2006, -07, -08 and -09, as well as photos from other events organised by Breast Cancer Care and Breast Cancer Campaign!! Piping at a photoshoot for 'Pedal-it-PInk', February 2010! To raise awareness of Breast cancer on behalf of the 'Breast Cancer Campaign'. 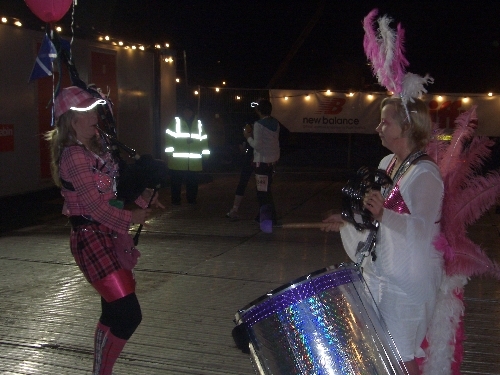 Piping on stage at the Edinburgh Moonwalk 2009! What an atsmosphere! You may spot Founder of Walkthewalk Nina Barough CBE and Presenters, Lorraine Kelly, Grant Stott and Arlene Stuart clapping along in the background! 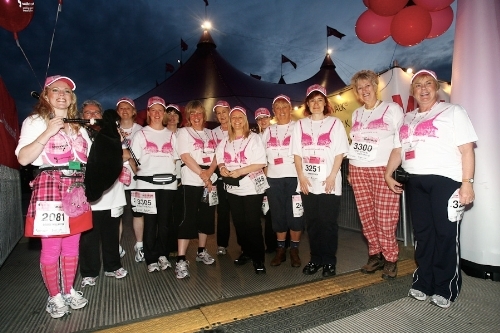 A nun, Edinburgh Moonwalk Tent 2009 and The Pink Piper! Great combination - Well done Moon Walkers!! Pictured here as the Pink Piper with T.V. Presenter Lorraine Kelly! Piping in front of the incredible Pink Moonwalk Tent!! With our Members of the Scottish Parliament!! June 2009! 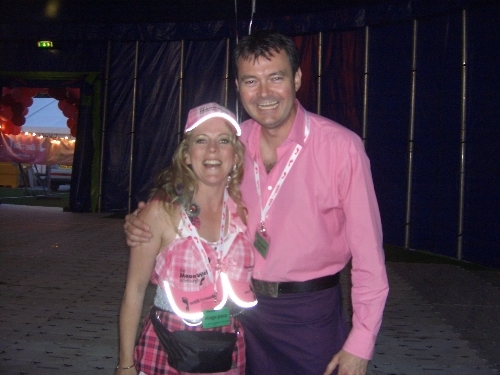 With Presenter Grant Stott - looking very pink! 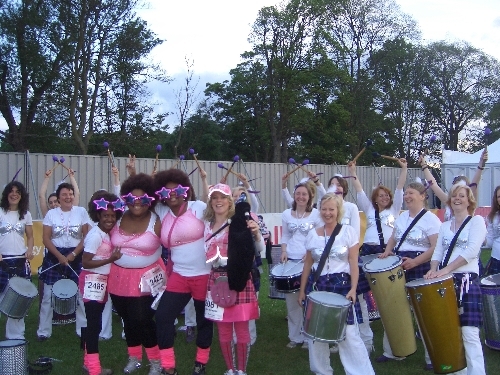 Playing at The Edinburgh Moonwalk, June 2009 with 'Commotion' Samba Band! And with our lovely triplet pink moonwalkers!! Playing as a duet with Elaine Bradley from 'Commotion Samba Band'! Before performing on stage together! Performing on stage in front of 12,000 bra-clad Power Walkers! Founder of Walkthewalk, Nina Barough CBE! Piping at the launch of The Edinburgh Moonwalk 2007! Heading off the Edinburgh Moonwalk 2007! With Lorraine Kelly and all our fantastic Moonwalkers! Pictured here beside my 2 pals from Dumfriesshire!! Well done girls for completing the Full Marathon! 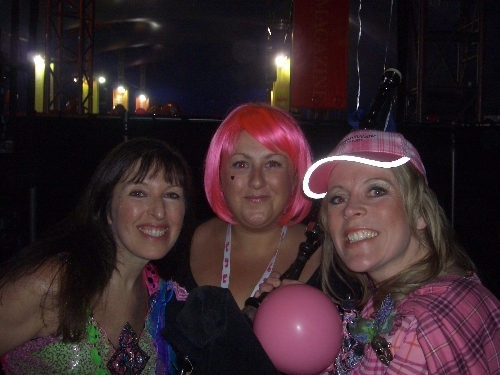 About to head off the Edinburgh Moonwalk 2007! With Presenters Grant Stott (having a wee tune), Lorraine Kelly and of course our Moonwalkers!! The photo sums up the amazing atmosphere!! 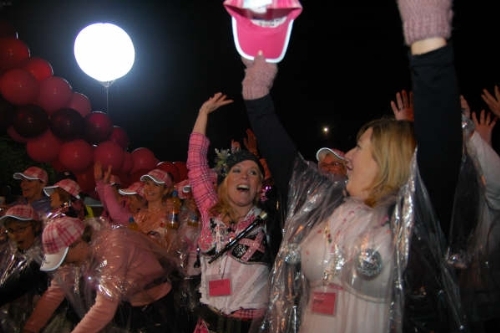 Almost midnight and raring to do our Half or Full Marathon in aid of breast cancer research! 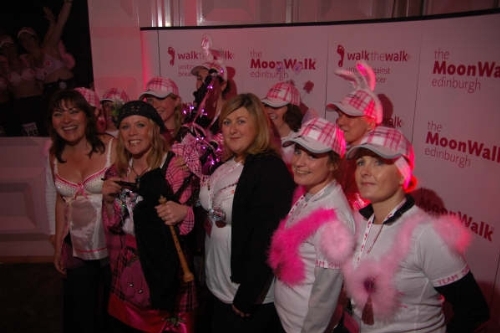 The first Moonwalk to be held in Edinburgh! Me and Lorraine Kelly, T.V. Presenter!! 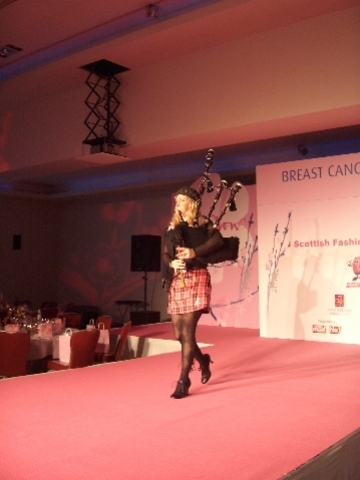 Piping at the Breast Cancer Care Fashion Show at the Raddison Hotel, Glasgow, 2006! Pictured here alongside T.V. 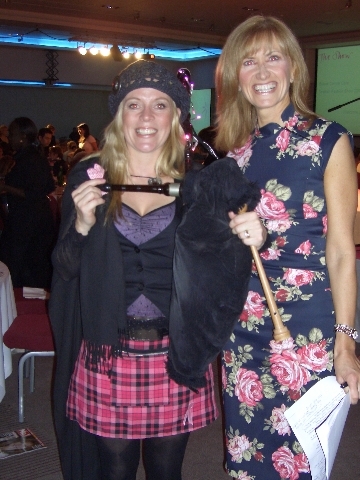 Presenter Jackie Bird! Pictured here on the Catwalk at the Breast Cancer Care Fashion Show!